For the third — and judging by my track record of being ill at Xmas — the last time, I got up early and walked into central London to hire a bike and cycle around taking photos of the city minus its human population. Well, almost deserted, and by 10am, while still incredibly empty, most of the main areas had people walking around enjoying the atmosphere of a silent city. Apart from the emptiness of the city, it is the silence that makes the experience such an addictive one for me. London is never silent, not even at 3am, but on Xmas morning, it is almost silent. The background drone of aircraft approaching Heathrow has gone, and away from main roads, the streets lack the sound of car tyres rolling over tarmac. Heading home, also a sound you never really hear now – the pealing of church bells. Not just coming from a single church you are nearby, but from all over the city as the sound carries far further than usual and surrounds you from all sides. Magical. This year though – Christmas Eve was on a Saturday, so I thought it might be possible to photograph the City of London on Saturday and save time. Despite what people might say, the City is never empty and quiet at weekends, as builders and maintenance workers displace office workers, and road traffic is still fairly high along the main roads. This year though, the city was unusually empty for a Saturday, and worth the effort. 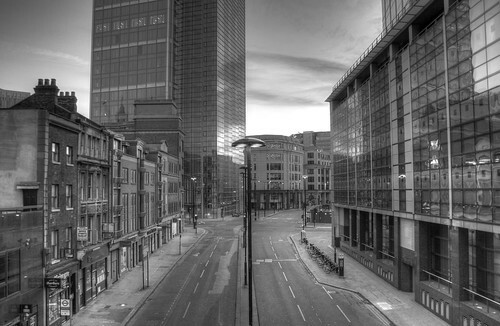 A few of my favourite “Deserted London” photos below – the full set from 2011 available here. Also, the original set from 2008 and some more from 2010. Well, you just have to try and recreate that famous scene from 28 Days Later. I rather like the combination of old and new buildings, and taking it in B&W seems to work better than in colour, especially for the older buildings. You don’t need to know anything about where this street is for it to work – as you see four lanes on the road and wide pavements and instinctively know it should be busy, but isn’t. One of the busiest bridges across the Thames. Again, this one seems to work better in black-and-white and the area seems to look more desolate as a result. Busy Bank with Mansion House standing alone over one of the main road junctions in the area. This was taken just as the sun was rising, so it lacks the “middle of the day” lighting effects of the other photos, but the empty street lined with so many shops and offices feels right for this. Not that good technically as it was just too early in the morning – but I did have a nice chat with three policemen who also turned up to take photos in the morning. 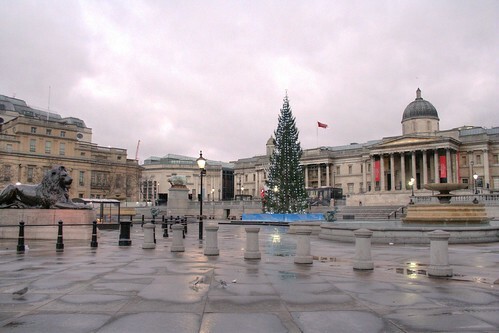 Empty Trafalgar Square – although there were a couple of security guards huddled in a doorway nearby. 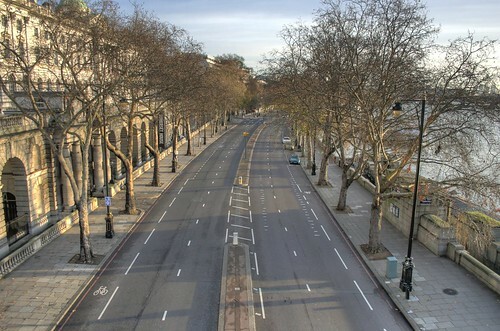 Hyde Park Corner – London’s scariest road junction looking a little safer than usual. 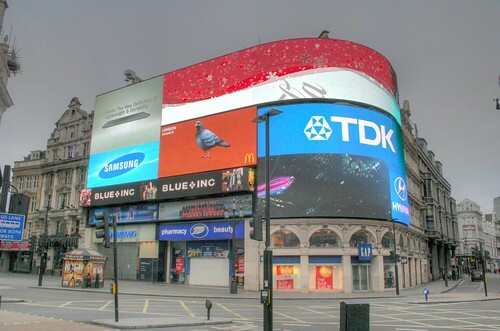 A giant pigeon in Picadilly Circus – presumably that advert isn’t a serving suggestion? And the new X-Crossing at Oxford Circus. Actually not as empty as it looks, I just had to wait a while for the cars to go away. I also had a nice chat with three Chinese tourists who were stunned at the lack of public transport. You can see the full set of 89 photos here. Ian, this is such a great post! I have Never Seen London like this! Would Not habe thought that it’s possible To be on an Empfang Tower Bridge…merry Christmas! Ian, those are fantastic photos. Ghostly. Is it my memory, or was it not that many years ago (pre Sunday shop opening) that the City was almost silent on a Sunday morning as well? It used ot be that on Saturdays and Sundays, the city was dead. Many times through the late 70’s and early 80’s, I went into Liverpool Street with my dad riding on the 149 and the only thing that used to be open was Dirty Dicks pub (where his brother used to drink) and the cafe that is now Pontis. My partner and I walked from St Paul’s back to Shoreditch along London Wall on Monday (Jan 2, Bank Holiday) and it was dead as a doornail. Quite eerie in fact. It used to die around 1pm on a Saturday afternoon, when the shops in the center closed. I can remember going to London in the 60s (in my teens) and being very disappointed at the quiet when I was expecting a “Swinging London”. Beautiful pictures. But reminds me why I prefer to spend Christmas away from the UK. 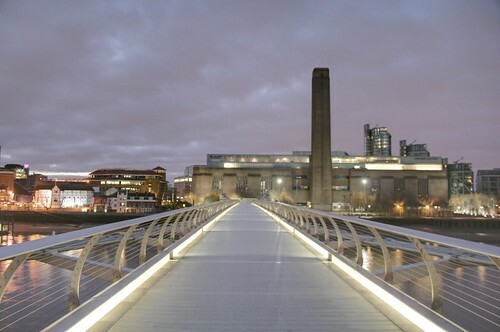 Looks too spooky for my liking but the Millennium Bridge & view towards Tate Modern looks absolutely stunning! 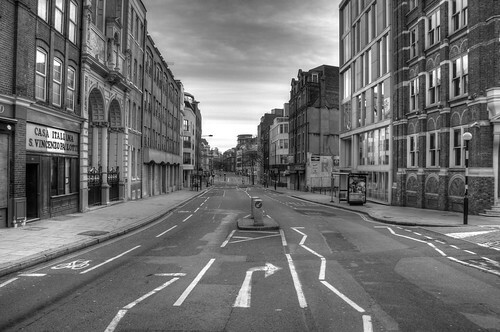 Amazing photographs Ian………..it’s quite unnerving to see the streets of London looking that way but it’s all down to the lack of public transport. I’m with the Chinese tourists on that one. Btw I really like the colour photographs and personally I think they work very well. Absorbing pictures, but I get a kind of sadness or melancholic feeling when viewing pictures of an apparently empty city. Did the Daleks finally win? Great pics – slightly eerie too. 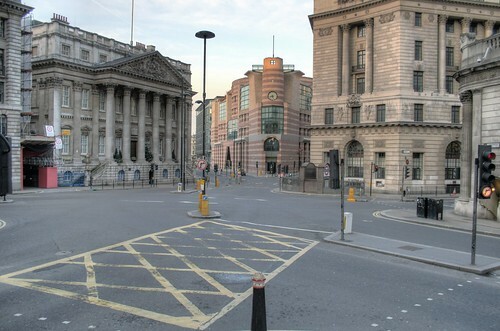 The only time I’ve seen the centre of London that empty was during a bomb scare. On the other hand, I had a wander around Crystal Palace Park yesterday (Xmas day) and that was very busy, and not just with parents taking the kids out to play with their new bike/remote controlled car. Well done. Great idea while I was asleep. Damn! There’s always somebody thinking a good idea even as I am recovering from getting plastered! Great photos! Looks like HDR through photoshop, but not much over the top tomemapping. Thanks for posting these. This talkes me back to my favorite part of traveling in Rome……early mornings with nearly no one in sight. Beautiful! Wonderful. I lived in London all through my twenties and early thirties, the days between Christmas and New Year were always my favorite, especially Christmas morning. One of my favorite memories of London is me and my girlfriend getting up early on Christmas morning, then taking the old Jaguar we were driving for a spin through the deserted city, with John Barry on the stereo. It was truly magical. Thanks for posting these. I need to get myself back over the pond one of these days. Great idea but I would love to have seen your project without all the photos being HDR processed..
Isn’t that a bit like saying “lovely cake, but I would have rather seen the ingredients first”? I only use HDR where it’s necessary to preserve contrasts between buildings and sky which isn’t really possible otherwise at that time of the morning. Great idea! Good thing iowntheworld featured a few of these great photos. I came here to see the rest. I was not disappointed.Nice work! Reminds me of the night I came out of the Green Room on John Adam st about 10pm (I think) to find The Strand deserted and covered with an inch of undisturbed snow. 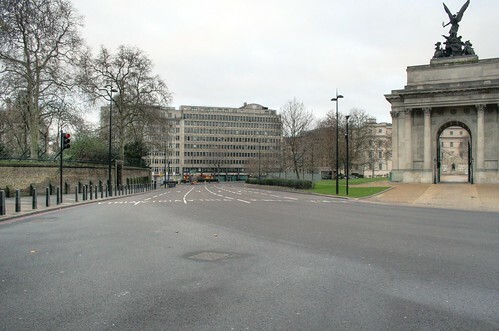 It was the night an IRA bomb went off on a bus at Aldwych, so The Strand was blocked off from Traf Sq. Really eerie. Wish I’d had a camera with me then. Beautiful pics. Thanks for posting. Wonderful motives and brilliant pictures? What type of camera did you use? Love those silent streets and the contrast of old and new. Must be a kick to be able to photograph so well. very fantastic. I love it. Wow – great shots! 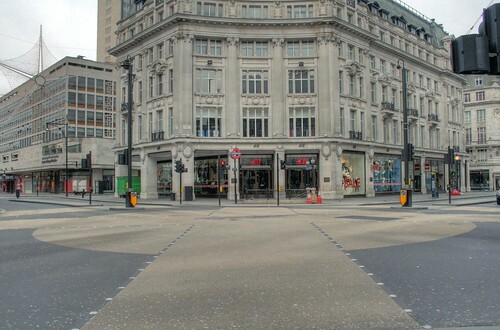 I’ve never seen Piccadilly Circus that bare before – very eerie! A friend sent me a link to your post. I try never to have people in my shots, so love your early morning jaunt! Thanks for postings those pictures. 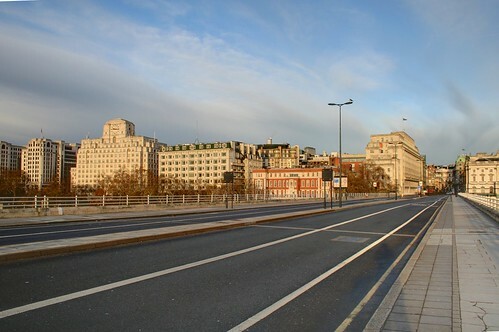 I just mentioned to some friends here in Berlin this Christmas Eve that London looks like 28 Days Later on Christmas Day and they didn’t believe me ;)…Just reminds me of riding from Brixton to the City to visit my landlady’s family in 1994. Due to the success of your project, next year the place will be jam-packed with photographers. Brilliant and a bit spooky. what is your username on instagram? I am perfectly happy using Flickr to host my photos. Brilliant photos tell a story , It could almost be a film set from ” The end of the world ” or a dawn of a new world” I loved them and think they would print onto Clothing very well !! Food for thought ! 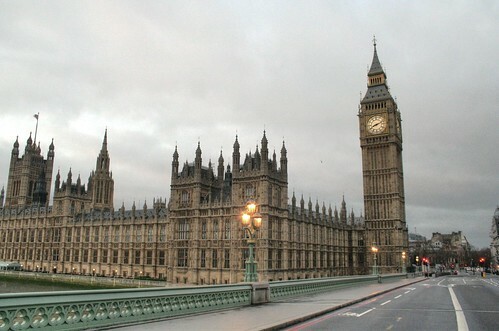 I’m gonna plan my visit to London on 25 December 2012. I want to see empty London. marvellous set of pictures! amazing to see nobody around – a job well done! as everyone has already said, the photo are amazing, but i wanted to comment on your statement that you have a track record for being sick at Christmas. i have known many people who had the same problem, only to find out that they were allergic to live christmas trees. they give off mold spores and make many unsuspecting people sick on the holidays. if you normally have a live tree, you should consider trying an artificial tree and see if that remedies the problem…it would be sad if you had to give up the tradition of taking these wonderful photos on christmas morning. Thanks, but this year was the first time I have had a Christmas Tree in over two decades – and it was artificial. It’s almost a relief to read that you had to wait for traffic to clear at Oxford Circus before taking the photo! Otherwise too spooky for words! I know of someone who drove from Suffolk to Hampshire on Christmas morning and went round the M25 – what an opportunity they missed…. A great set of photos Ian, thanks for sharing them with us. I like it. Very beautiful. But it’s awesome if london is silent cause of another reasons. Wow, a total opposite from my trips there during the touristy season . Nice set! Thanks. Amazing to be able to see these iconic places sans humans. How did you get around, you seem to have covered a lot of areas. Was it a case of u could dump your car any where as no chance of a ticket ? I came down to London on the bank holiday in August, first time I had been to photograph it and really struggled for time. It’s there in the first paragraph – he walked in and hired a bicycle. Fantastic pics, by the way. Great set of images congratulations on a good result. It took me an age to get used to the fact that here in Spain (or at least in the warmer parts!) everyone is out strolling or doing something sporty on the 25th – in attempts to work off the feasting of the night before, when the main Christmas family meal is enjoyed! The kids don’t get their presents until January 6th, so although it’s a holiday it’s a pretty normal day for street activity! Amazing that London is so quiet. I especially like your comment about the pealing of the many church bells throughout the city and can imagine how special that must have been to hear. Nice work. Thank you very much for sharing these. They’re just lovely! Great photos!! I had never seen London so silent and empty, it is very amazing!! Wow, you weren’t kidding when you said “empty”! I have never seen anything like this before, London is usually so packed that I thought it would be busy even on holidays. Wow! Absolutely beautiful! I would have never thought that London could ever be so quite even on Christmas day! My husband and I were in London Christmas Eve and day, but we were still asleep when you were going around taking amazing pictures. 🙂 We went out later and there were people everywhere! Thanks for sharing! These are stunning – thank you so much for sharing, and for rising so early to capture the desolate streets! Brilliant collection of shots at such an opportune time! Love the emptiness of a normally busy city! Wow – this is awesome! And a great inspiration as well. It’s amazing to see the city that is usually so full of life that empty. I would think that even on Christmas morning there would still be quite a bit of activity. Did you have to wait for just the right moments when cars and people left your framed shot or was it really that empty? This is my town where I have live almost my entire life……you’re photos are stunning. Amazing Photos! Thank you for sharing them, and Merry Christmas! I’ve never seen London like that. It’s just too empty. But it is indeed very interesting to see the streets abandoned. Great shots! Great photos. The B&W works well in sleepy London. I can remember London back in the 60s when you could have fired a shotgun up Oxford Street and not hit a single person, except perhaps, for a cleaner or two. Another great memory was having breakfast in the Mayfair area in winter when it was still quite dark, something that doesn’t happen here in sunny Queensland. I have lived in central London for over 20 years and spent only one Christmas and New Year at home during that time and your great photographs demonstrate the reason why I travel abroad at this time of the year. 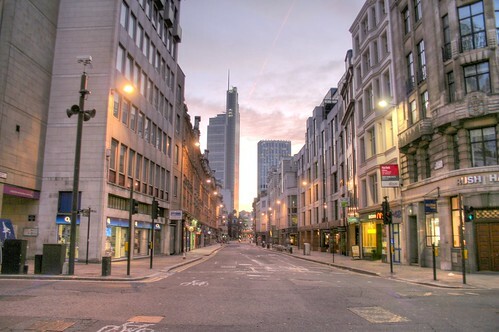 17 Pings/Trackbacks for "Photos of an Empty London on Christmas Morning"